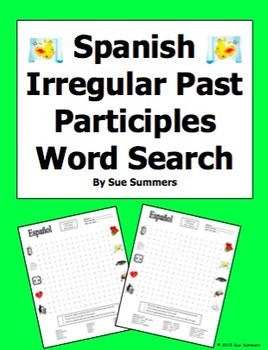 This Spanish irregular past participles word search contains 15 common Spanish irregular past participles and 10 images. 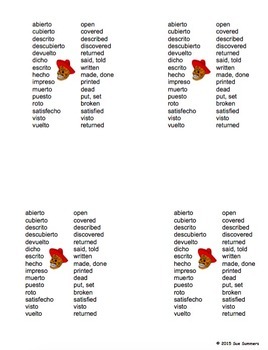 Included are abierto, cubierto, descrito, descubierto, devuelto, dicho, escrito, hecho, impreso, muerto, puesto, roto, satisfecho, visto, and vuelto. This resource works well as a sub lesson plan. When students complete the 3 activity tasks, they can quiz each other on the past participles using the student handouts. 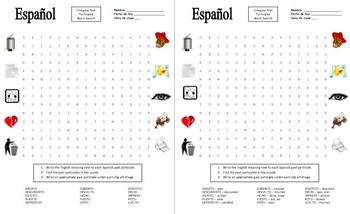 Please click here to see more of my Spanish puzzles.